We shared the very good times we had with Kawasaki’s two Z900s in our May 2018 issue. Ultimately, the RS came out ahead, and not just because of its good looks. Although the ultra-modern-looking Z900 ABS is a better bike on paper, the root beer retro-bike was just so damn rideable. I’m not in the habit of timing “laps” on my favorite local twisties, but I certainly felt faster, more connected and comfortable aboard the new school UJM than on other bikes in recent memory. You can check out our full review and photos of Kawsaki’s Z900RS here. 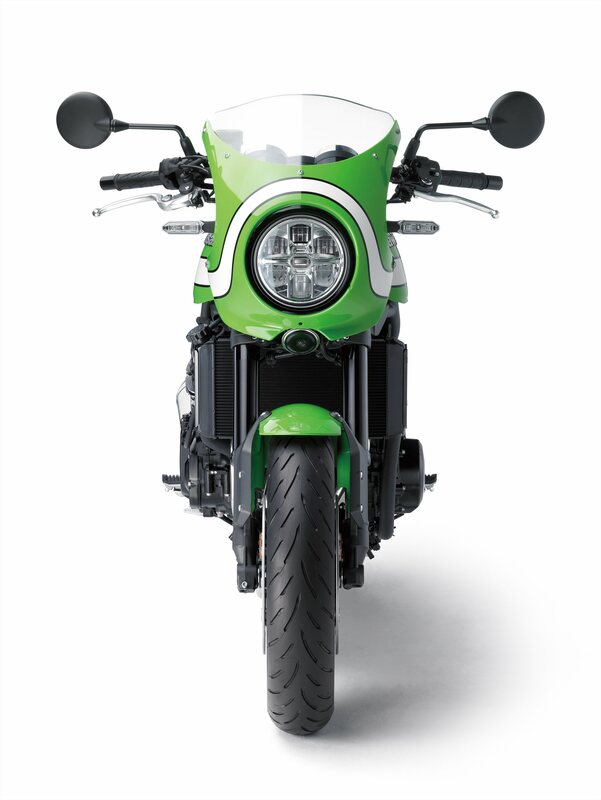 A ZRX12000R in green, as God intended. But it’s not like I didn’t have complaints, chief among them the fact that it wasn’t proper Kawasaki green. Coincidentally, I had a conversation with longtime CityBike columnist Maynard Hershon earlier this month about this very thing. He’d been thinking of selling his trusty ZRX1200R, and I told him that if it was green, I’d have snapped it up. He agreed: his first ZRX, an 1100, was green, but his current one is red. The color grew on him, just as the RS’s “candytone” orange and brown grew on me, but I think deep inside, we both know a proper ZRX or Z900 ought to be green. He decided to keep his 1200, by the way, as he should, despite its inappropriate red-ness. 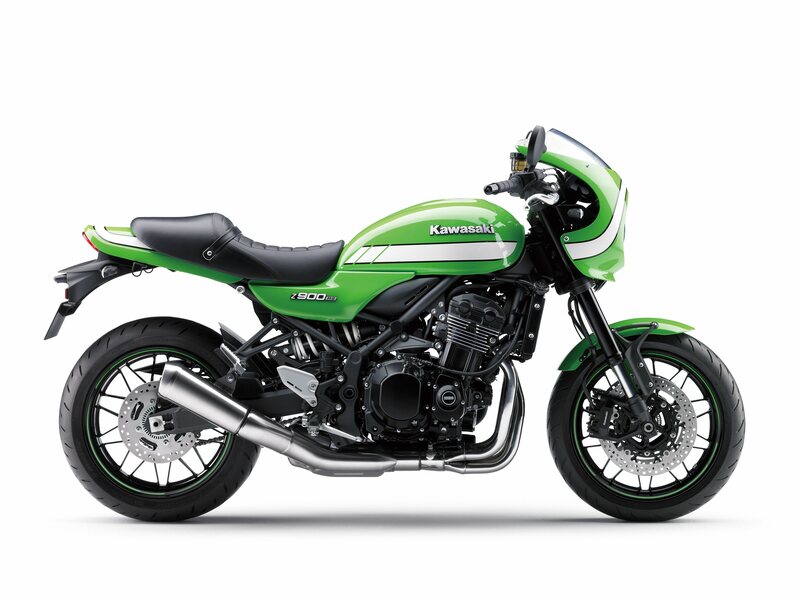 All this is a typically wandering preamble to the news we got this morning, that the lower-bars-and-little-fairing version of Kawi’s kickass Z900RS will be available in the US, appropriately called the Z900RS Cafe—and appropriately painted green. There’s really not much more to it than that. In addition to presumably mean green-ness, the Cafe gets that nifty little fairing, which Team Green calls a “cafe-racer style front cowl,” and black “drop-style” handlebars, which though called drop-style, look to my eyes more like a near-flat or drag bar—they’re certainly not down at real-cafe clubman bar level (a good thing!). 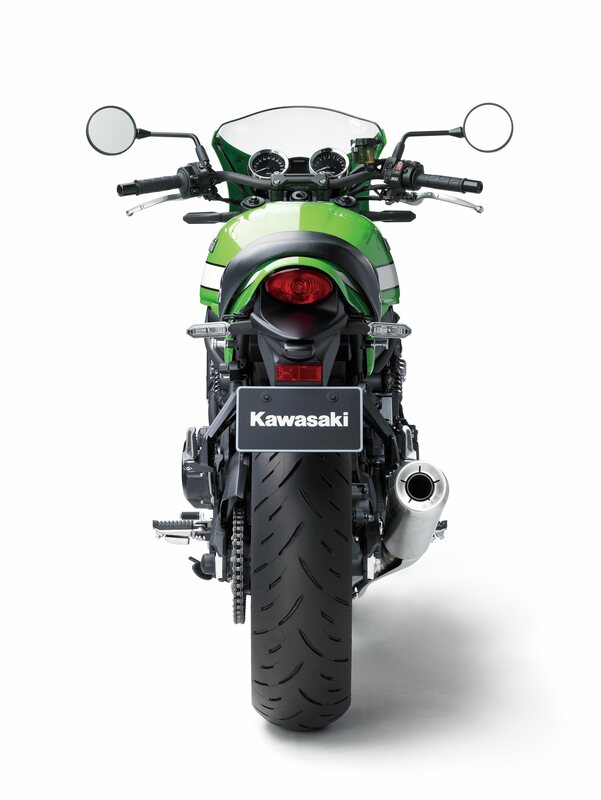 Kawasaki says the seat is “cafe-racer style” as well, which as far as I can tell means it’s got a bit more of a hump than the nearly flat banana of the standard RS. The other difference between the RS and the mean green coffee machine is the brushed finish on the silencer. 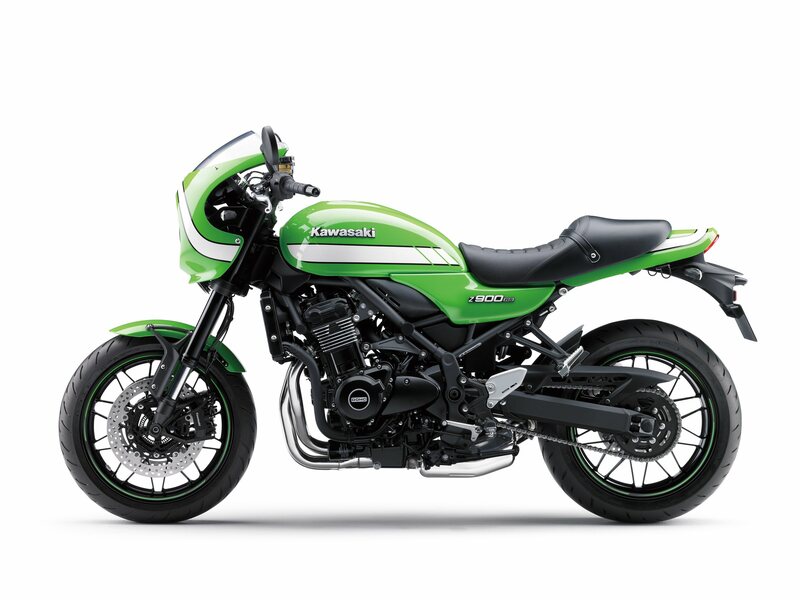 I know a lot of bike buyers immediately replace the stock can, and Yoshimura did just announce an awful nice-looking replacement muffler for the RS, but trust me when I say this: Kawasaki’s talk about the RS being their first bike with a tuned exhaust note isn’t marketing fabrication. The bike sounds great, and it’s safe to assume that the brushed finish sounds just as good as the chrome. Honestly, the candytone bike ain’t bad, even if it’s not green. All this jolly green goodness means the bike weighs just a bit more: wet weight is 474.1 pounds versus the candytone RS’s 471.9, a gain of a whopping 2.2 pounds! It’s ok, because your wallet will be a little lighter—MSRP for the Cafe is $11,499, while the black RS is just $10,999 and the candytone RS is $11,199. That’s right, going green will cost you a little more green. Groan if you will, but how often can I crack such perfectly bad jokes? 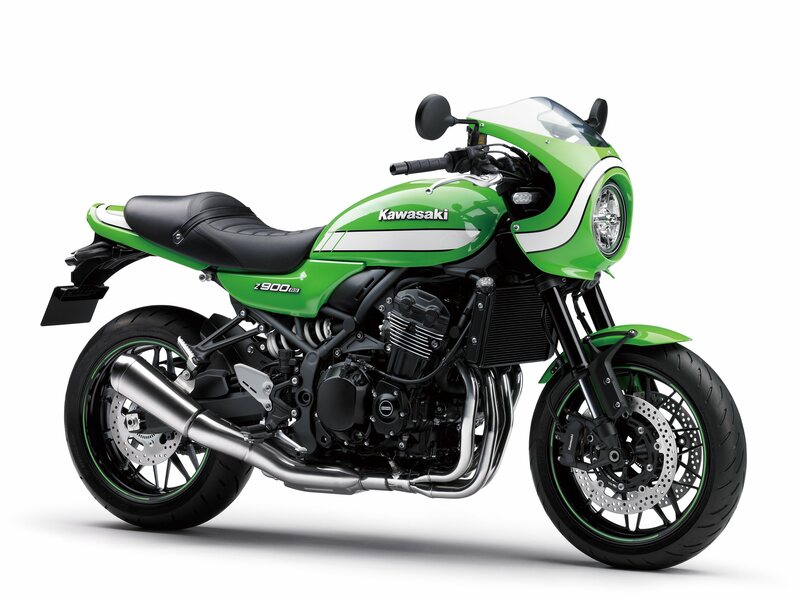 Another thing that may make you groan: Kawasaki says the mean greenie is a “limited production model,” presumably because it ain’t easy being green. There’s no word yet on how limited, but I’ve asked that as well as when we can expect these in shops. I’ll add that information as soon as I have it. 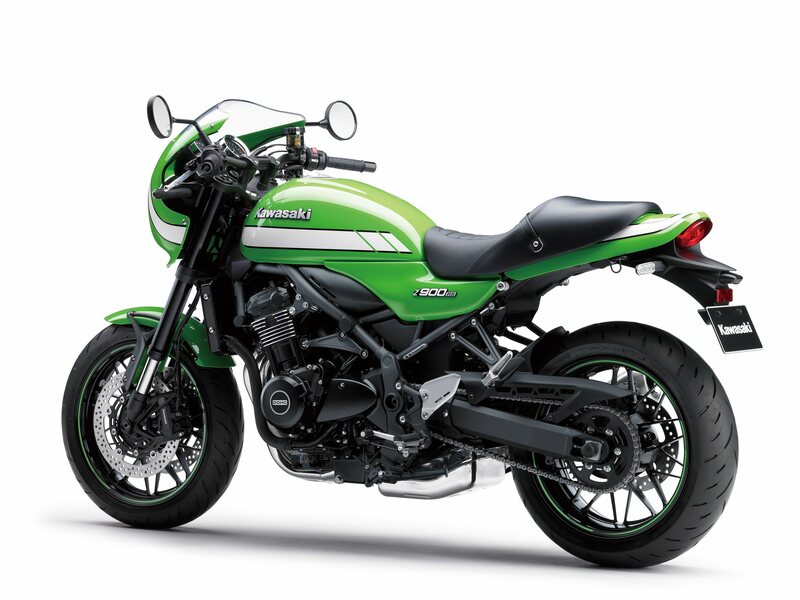 Hard to say what that means, really, but if you’re set on making your friends green with envy, it’s probably better to get to your favorite Kawasaki shop sooner rather than later. We’ll withhold judgement on whether being appropriately Kawi-colored makes the Cafe a better bike than the standard RS until we get a chance to wheelie one. It’s a tough call, and I’m a little worried that the lower bars may hurt the perfect (for me) rider triangle of the decaf bike. 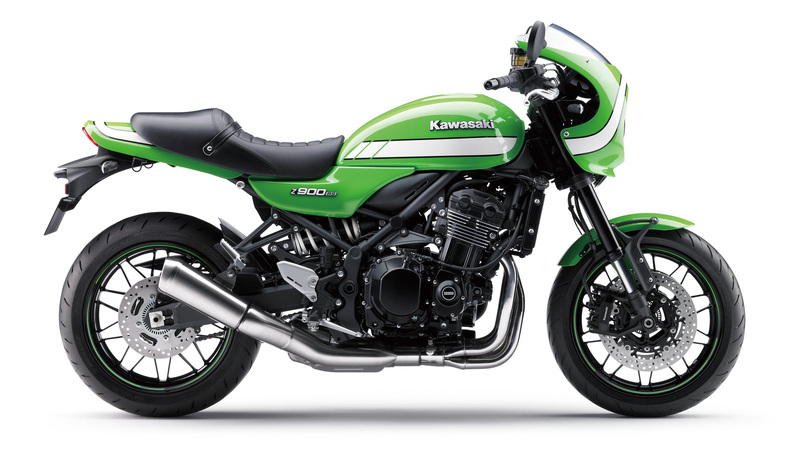 Maybe, like Maynard with his red ZRX, I’ll have to settle for a Kawi painted the “wrong” color. While we’re sorting out that dilemma, howzabout some photos? This last one shows the differences between the standard and Cafe Z900RS versions, most importantly in my mind, handlebar height.